O/o Town & Country Planning, Tinsukia. filling up the vacancy in the post of L. D. Assistant in the office of the Executive Engineer, Drainage & Sewerage Division, Town & Country Planning, Tinsukia. Educational Qualification: Graduate from any recognised university. The candidates must possess a minimum 6 months Diploma/ Certificate in Computer from Govt. recognised institute. Age : Candidates must not less than 18 years and not above 43 years as on 1st January’2017. Application Fee: For. OBC/MOBC Candidates + Rs. 150.00 (Rupees one hundred. fifty) only. Application fees is exempted of BPL candidates (BPL, certificate must be enclosed in support) Fees should be deposited only through Treasury Challan in the Head of Account “0070- other Administrative Services-60 Other Services- 800 receipts”. Selection Process: The candidate whose application is accepted will be required to appear in a written test. 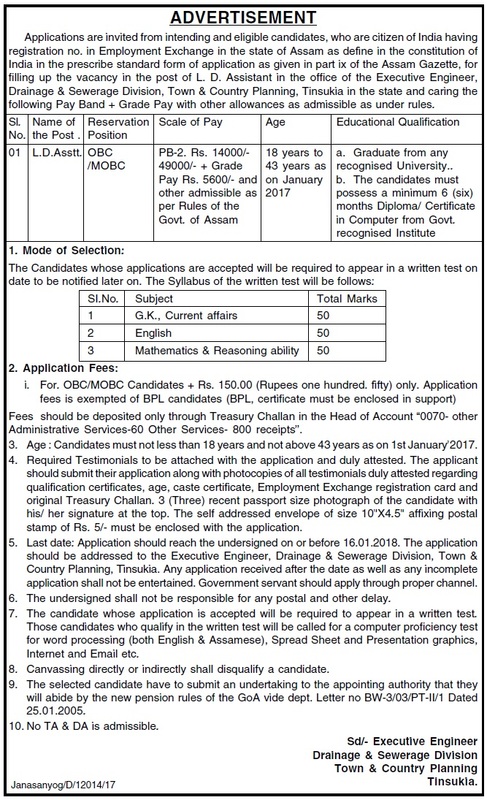 Those candidates who qualify in the written test will be called for a computer proficiency test for word processing (both English & Assamese), Spread Sheet and Presentation graphics, Internet and Email etc. How to apply: Required Testimonials to be attached with the application and duly attested. The applicant should submit their application along with photocopies of all testimonials duly attested regarding qualification certificates, age, caste certificate, Employment Exchange registration card and original Treasury Challan. 3 (Three) recent passport size photograph of the candidate with his/ her signature at the top. The self addressed envelope of size 10"X4.5" affixing postal stamp of Rs. 5/- must be enclosed with the application. Application should reach the undersigned on or before 16.01.2018. The application should be addressed to the Executive Engineer, Drainage & Sewerage Division, Town & Country Planning, Tinsukia. Any application received after the date as well as any incomplete application shall not be entertained. Government servant should apply through proper channel.